Gauge guards and gauge seals are important in many fluid handling applications as they isolate the pressure gauge or vacuum gauge from the process. Isolation is a way to achieve chemical compatibility, maintain sterility, manage temperature, address viscosity, and adapt to particulates. 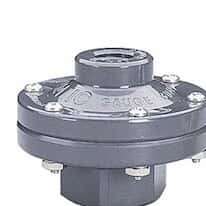 A pressure snubber is an in-line fitting used to slow the transfer of pressure to the gauge or tranducer, protecting those measuring instruments from sudden pressure fluctuations.